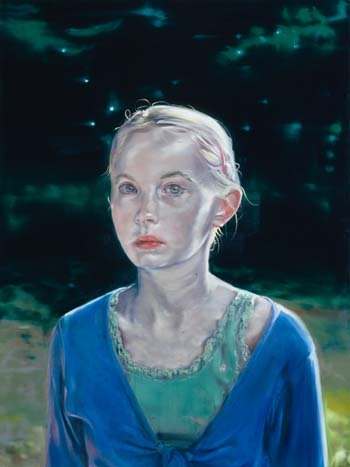 A Lancaster University arts graduate has won the £25,000 first prize in the BP Portrait Award 2009. Peter Monkman, who did a BA in Visual Arts in 1985, was awarded the prize for a portrait of his 12 year old daughter Anna. Currently director of art at Charterhouse School in Surrey, he also wins a commission worth £4,000. The painting will now go on display at the National Portrait Gallery in London as part of the BP Portrait Award exhibition from 18 June – 20 September. The winners were announced by the novelist Sebastian Faulks at the National Portrait Gallery. It is the first time Peter’s work has been shortlisted for the award, which saw a record number of entries this year. The winning portrait – “Changeling 2” – is part of a series of portraits of his daughter at different ages. It explores the concept of the changeling, a child substituted for another by stealth, often with an elf. The initial ideas for this portrait came from photographic studies of Anna playing in woods in Brittany where the light had a magical quality. The second prize of £8,000 was awarded to Michael Gaskell for “Tom” and the third prize of £6,000 to Annalisa Avancini for “Manuel”. The BP Young Artist Award of £5,000 was awarded to Mark Jameson for “Benfica Blue”.